Peaches. Lately I’ve been harassing encouraging anyone who will listen to try Frog Hollow Farms peaches. They are the best in orange, fuzzy goodness that California has to offer. Farmer Al Courchesne has been growing these beauties on his farm near the Sacramento Delta for over thirty years. In the Bay Area, you can get them from Whole Foods Market or at the Frog Hollow Market at the Embarcadero Ferry Building. If you’re like my friend Leigh, or me, and you grew up with peaches or nectarines in your backyard, you knew what summer fruit was supposed to taste like, to smell like. But maybe because it’s been so long since you tasted fruit that wasn’t picked before it was ripe, that was sprayed with stuff to keep it from ripening until it got to the store. It’s understandable. 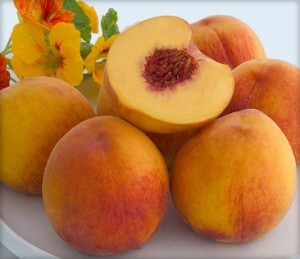 I love the kind of peaches we had as kids, the kind you could smell in the bowl on the counter before you even touched them, that were juicy but not squishy, the kind that filled your entire head with the nectar of sweet summer after one bite. If you love these too, or if you’re reading this and realizing you’ve never had the experience of California’s finest fuzzy gold, then you must (here I go again!) track down some Frog Hollow Peaches in the next few weeks. I think they even ship them across the U.S. I know there are lots of readers around the world. Don’t fret. I’m sure you have your yummy fruits that I can’t even imagine. Please share in comments. I’m not working for Frog Hollow, I swear. It’s just that this year, their crop really sent me over the edge. 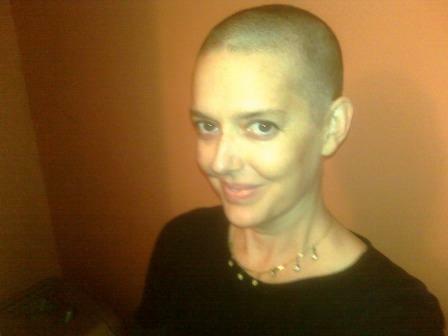 With my chemo treatments, I can barely taste anything. I’m so grateful to be able to taste the peaches. So grateful. I know that I’m known for hyperbole and, even at the age of forty, often use more than one “o” for the word so. As in, the peaches are soooo good. But this time I mean it. When you try the peaches, let me know how you like them. Below is a salad I like to make with peaches, romaine, and herbs straight from the garden. I’m still trying to get the recipe for Heather’s “Disappearing” Peach Crisp. I’ll post that soon too. Oh, and below the salad is a picture of my very own newly shorn head, in keeping with the peach-fuzz theme. Stuck here in a southern winter the idea of a summer peach is almost too much to bear….although our oranges, pears and apples are still yummy! Wish we could all be there with you in a few weeks too! Thinking of you and Dennis and Little J and imagining peach juice dribbling down our chins. Yum. I like a peach with balsamic over vanilla ice cream with basil. A little freaky, but good.